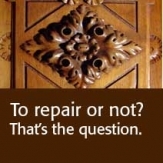 This is a frequently asked question in the furniture conservation trade. Why repair furniture that functions well and looks just fine? Take for example a desk that was restored 20 years ago (pictured below). The professional who dealt with it at the time decided – either on his own or together with the owner – to significantly darken the appearance of the desk. Should the desk be "repaired"? Should it be restored to its original finish? Would such intervention harm it and perhaps diminish its value? Repair is a must in this case. When examining a piece of furniture one must always ask why previous interventions were carried out. Why was this particular desk stained so dark? Sometimes beautiful and exotic veneers are stained in this manner because the restorer didn’t want or know how to deal with the particular defect requiring restoration and chose to hide it instead. It is rare that a client will demand dark stain on especially beautiful veneer. Repairing furniture that has been stained dark usually presents surprises, both good and bad. Good surprises unveil the intentions of the original cabinetmaker: special construction methods, interesting inlays, exotic veneers. Bad surprises may expose unprofessional repair work: filling-in holes with inappropriate materials such as epoxy or replacing missing veneer with modern synthetic wax. 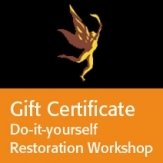 Not only are these techniques irreversible and make future restoration and repair virtually impossible, they seriously diminish the value of the piece. Proper furniture repair and restoration require the use of filler based on gesso, hide glue and earth tints, or simply inserting the right veneer to replace the missing pieces. The client that sent this furniture to be repaired in my shop wanted to restore it to its former glory. He had a hunch that the previously applied dark stain was hiding some interesting veneer and wood. He was right. But furniture repair in this case was not only a matter of refinishing the desk without staining it. 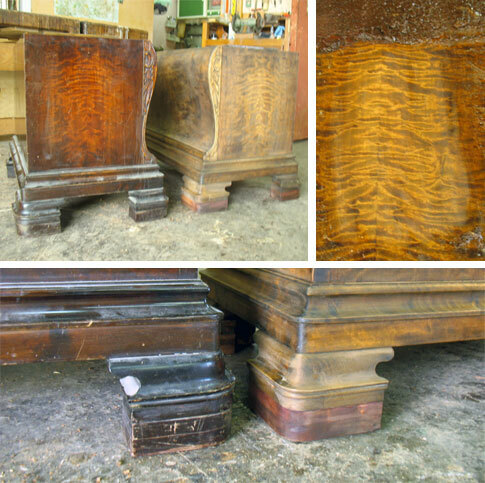 Close examination of earlier work revealed that unsuitable wood had been used in several places, and holes, scratches and missing veneer had been filled with modern epoxy. Staining the desk dark had been the shortcut to dealing with these problems. Classic furniture repair dictates a different intervention. Where veneer is missing the restorer must insert a piece of veneer that suits the type or at least matches the grain of the veneer that is still intact. When there are deep gashes or whole pieces missing, suitable wood that matches and breathes with the rest of the piece has to be inserted. One of the basic tenets of classical furniture repair is to be as faithful as possible to the methods of work carried out by the original creator of the piece. 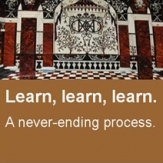 This might involve, for example, French polishing by hand without applying stain – an important restoration technique that has no substitute.